Brandon Turkus January 16, 2018 Comment Now! 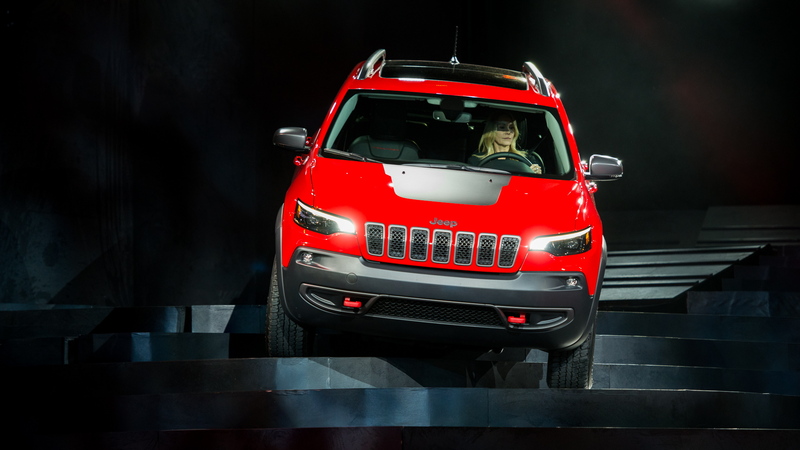 The 2019 Jeep Cherokee is a course correct for the iconic off-road brand, softening the polarizing style introduced in 2014 for something more in line with the brand’s other offerings. In refreshing the crossover, Jeep design boss Mark Allen told Motor Authority his team “didn’t want to take all the weirdness out of Cherokee,” adding that the new look “just fits better.” We couldn’t agree more. The Cherokee KL’s multi-tiered design gives way to a more conservative style. 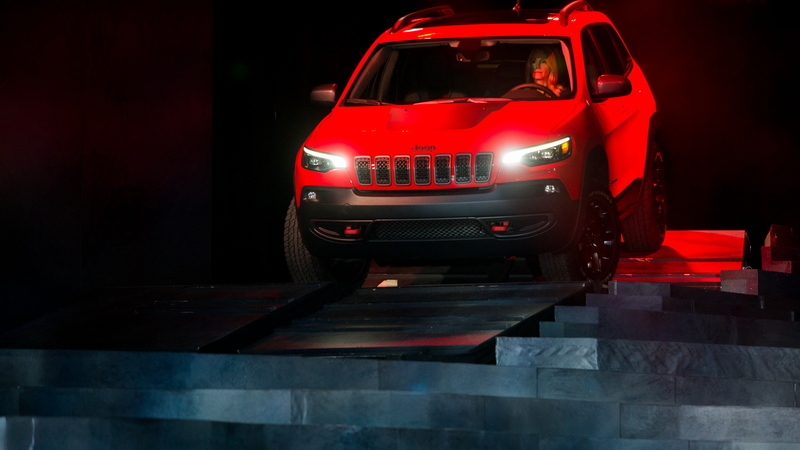 Jeep integrated the high LED running lights into a more conventional design while what used to be the Cherokee’s headlights have been demoted to simple foglights. Along with a cleaner front bumper, the overall look is closer to the handsome Compass. In back, Jeep restyled the taillights to, again, bring them more in line with the Compass. The LED units are clean and attractive and flank a redesigned tailgate. The new lid refocuses the tail by moving the license plate and tailgate handle up in to the center of the liftgate, allowing Jeep to deliver a cleaner, more attractive rear bumper. The relocated license plate also helps tie the Cherokee’s tail in with the Compass and Grand Cherokee. Changes in the cabin are more modest. Jeep focused on material improvements rather than broader design changes, ditching the boring black plastic around the infotainment system with Piano Black trim and using chrome accents around HVAC vents and other areas. Jeep did make one big structural change, though, rearranging the design of the center console to better accommodate today’s smartphones. 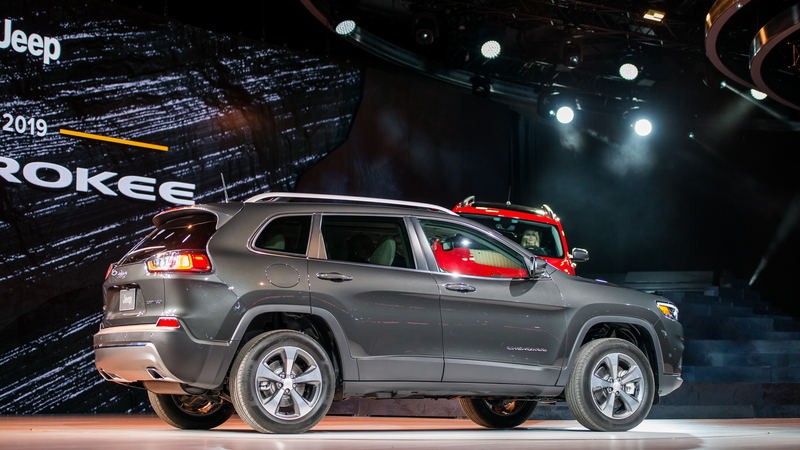 Under the Cherokee’s new hood sits an equally new engine—a 2.0-liter, turbocharged four-cylinder. A relative of the Alfa Romeo Giulia’s 2.0-liter, the Cherokee’s newest engine generates 270 horsepower and 295 pound-feet of torque, the 2.0-liter is nearly as powerful as the 271-hp 3.2-liter that Jeep will offer alongside it, but far torquier than the 239-lb-ft V-6. Jeep hasn’t release fuel economy figures for its new turbo, which is also appearing as part of a mild hybrid setup in the 2019 Jeep Wrangler, but with standard stop/start, it’s a safe bet that it will eclipse the old V-6. The 3.2-liter is still the towing leader, though, boasting a best-in-class 4,500-lb tow rating. 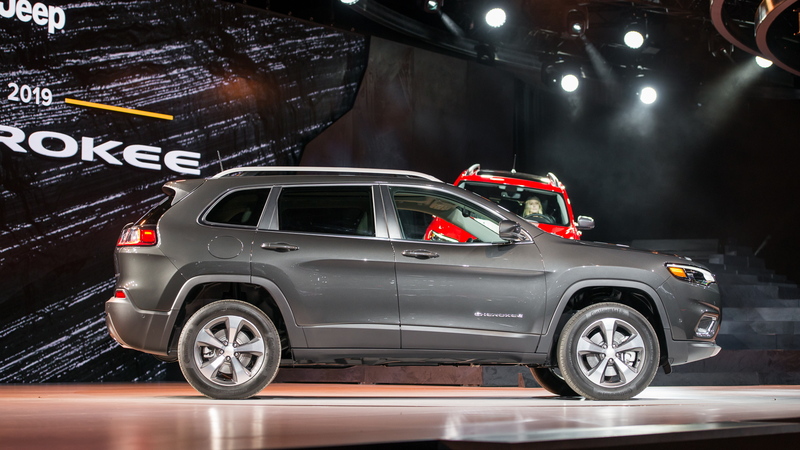 Aside from the 2.0-liter and the 3.2-liter, the Cherokee will continue to come standard with a 2.4-liter four-cylinder that retains last year’s 180 hp and 170 lb-ft of torque. Nine-speed automatic transmissions are standard across the board. 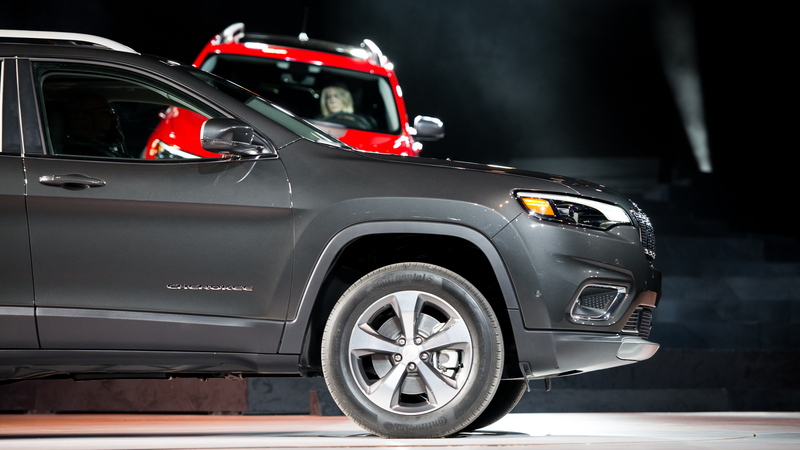 Jeep took an all-encompassing approach to weight savings for the 2019 Cherokee. The hood is aluminum while the tailgate is a composite—both are lighter than last year’s crossover. An updated Active Drive I four-wheel-drive system is both lighter and more fuel efficient thanks to a new rear-drive module. While Jeep is debuting the 2019 Cherokee at the 2018 North American International Auto Show, we’re barely a week away from taking our first drive in this new model. Look for much more soon. And for more from Detroit, head to our dedicated hub.